As you all probably know by now…..I am an orange fan. I love orange flavor. In fact, I was trying to decide what I wanted to post tonight…my orange sour cream scones or these amazing cookies. The scones will come later. You have to know about these cookies. If you’ve never experienced the orange and chocolate combo, you are missing out. Orange and chocolate go so well together. This cookie may just be my new favorite cookie. 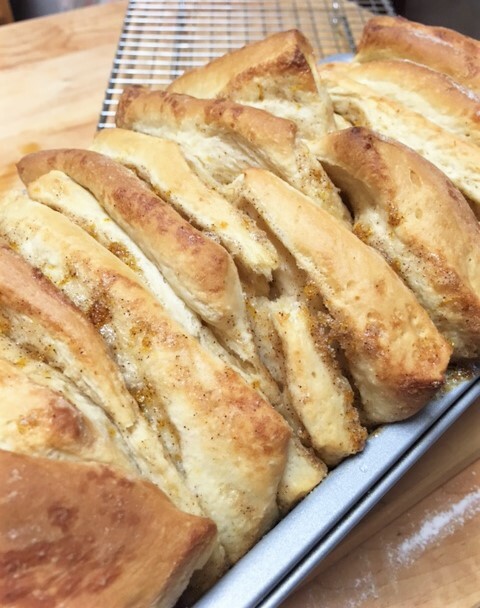 I found the recipe on line several months ago, but I changed it up…the person who posted it, changed it up from another blogger. 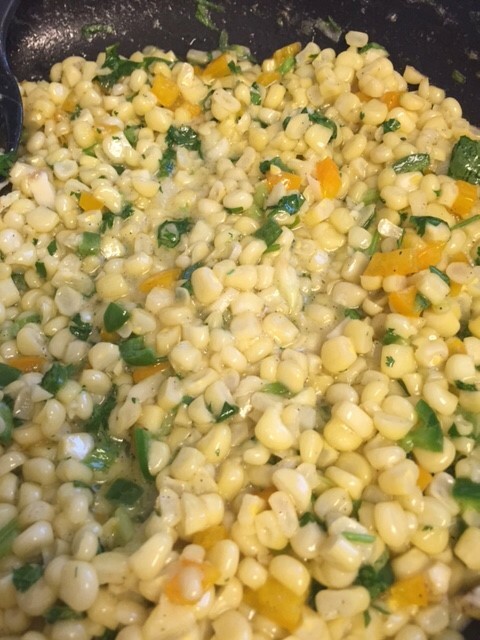 That’s the fun thing about recipes….you can change things to your liking. 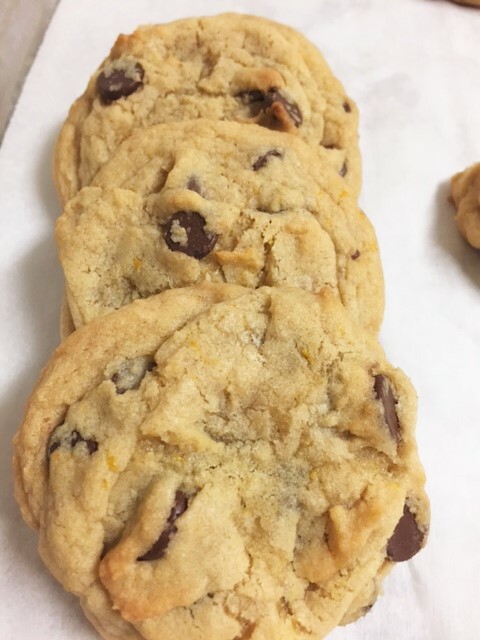 This cookie has good chew, just enough crisp on the edges…..it’s thick, intensely orange and you get your chocolate fix. 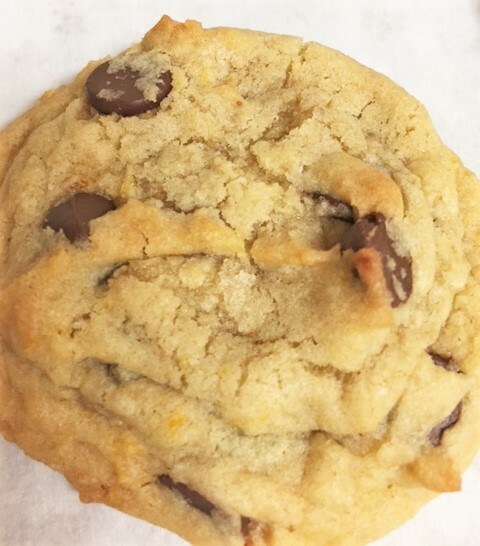 I think it may be a healthy cookie cuz of the vitamin C in citrus, right? Hmmm. You gotta make these. I’m just so excited to share this….I want to go outside and shout out just how good these are! But my neighbors may think I have lost my mind. They already tease me about getting so excited over food stuff. OH!!! Did I mention how good the dough is??? I’m not a cookie dough gal, but OMG!! Line baking sheet with parchment. Set aside. 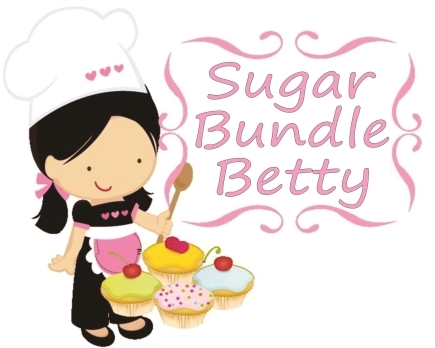 In a bowl, mix together the flour, cornstarch, baking powder, baking soda and salt. Set aside. In the bowl of an electric mixer, using the paddle attachment, beat the butter and sugars together until light and fluffy, about 2 minutes. Add the eggs and mix well. Add orange zest and mix until combined. Add the flour mixture to the sugar mixture, mixing gently. Stir in the chocolate chips . Drop scoops of dough (about 2 tblsp) on the baking sheet. Bake for 10-11 minutes. Center should look a wee bit moist. Let the cookies completely cool on the sheet. 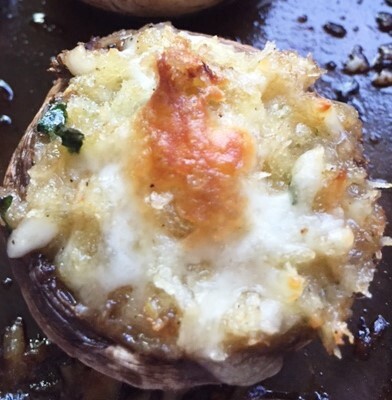 There are a bazillion ways to do stuffed mushrooms. I think I’ve made em all. Yep, I have made a bazillion of them. I have so many favorites. My all time favorite is crab and cheese I think. Or maybe it’s the sun-dried tomato pesto. But it might be the bacon blue cheese. I mean, you could stuff anything in a mushroom and it would be good. I love mushrooms. 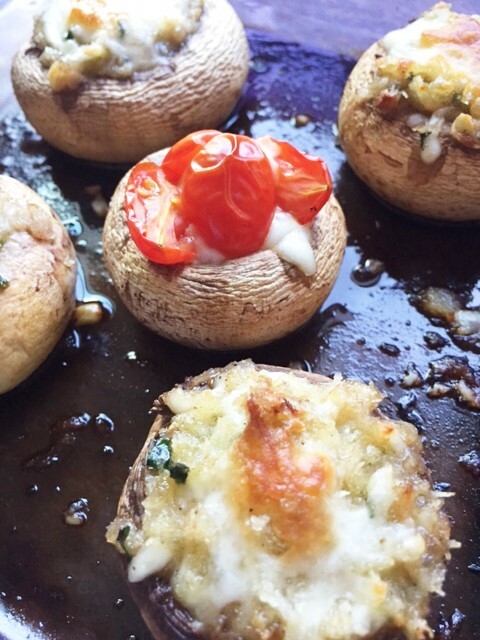 The ones here are veggie…….stuffed with more mushroom, bread crumbs, cheese, spinach, etc. I served them with a nice roast and it was the perfect pairing. Wash and carefully remove stems from mushrooms. If your mushrooms aren’t big enough to hold much filling, gently scoop out some of the mushroom with a spoon. Mince up the mushroom stems and the spinach leaves. In a skillet, melt 2 tablespoons of butter and add the minced stems, spinach, garlic, shallots, salt and pepper. Stir around for about a minute or so, until everything starts getting soft. Stir in the bread crumbs, until everything is well combined. Remove from heat and dump mixture into a bowl. Stir in most of the cheese, leaving a bit to sprinkle on top. Fill the mushrooms. Sprinkle with cheese. Place in a buttered baking dish. I add about 1/2 cup of white wine, but it’s not necessary. Place in 350 degree oven for about 15-20 minutes. My picture above shows a mushroom with tomatoes. I just had a bit of leftover cheese that I stuffed into a mushroom and pressed a grape tomato into it…..very plain, but delicious. 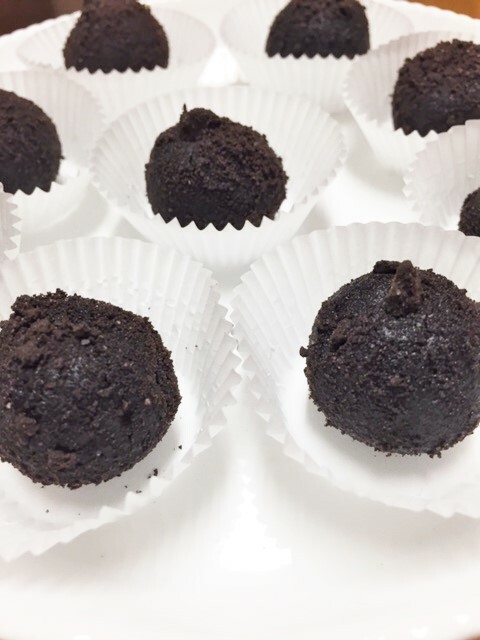 Quick and Easy Oreo Cookie Truffles……. Looking for a super quick treat? 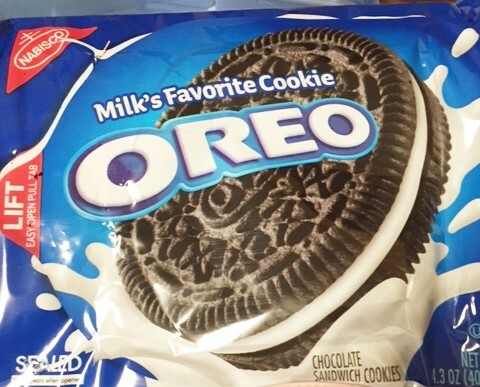 I don’t know one person who doesn’t like Oreo cookies. Cookies and Cream ice cream, cookies and cream cupcakes, cookies and cream bark, cookies and cream cake pops……I’ve made them all. Now, these are alot like cake pops, but they aren’t dipped in chocolate and they are not on sticks. Now, of course you could do that if you want to, but I wanted something a bit more creamy and something quick and simple. I am calling these truffles. These make a great gift. They’re simple, but rich and delicious. They are so pretty too. With the holidays approaching……EEK, can you believe it?…..these would be a great gift. You could dip some in chocolate, drizzle with white chocolate, roll them in cocoa, sprinkles or nuts. The possibilities are endless. This time, I just rolled the balls in crushed cookie crumbs. Then you could put them in a pretty little candy boxes or a nice tin, tied with some ribbon. Who wouldn’t be happy to get that! These are super simple and quick. So, no excuses to all of you “non bakers”. There is no cooking or baking involved. You can get out all your frustrations by crushing the hell outta some cookies. You get to play with “dough” and they are so inexpensive to make!!! 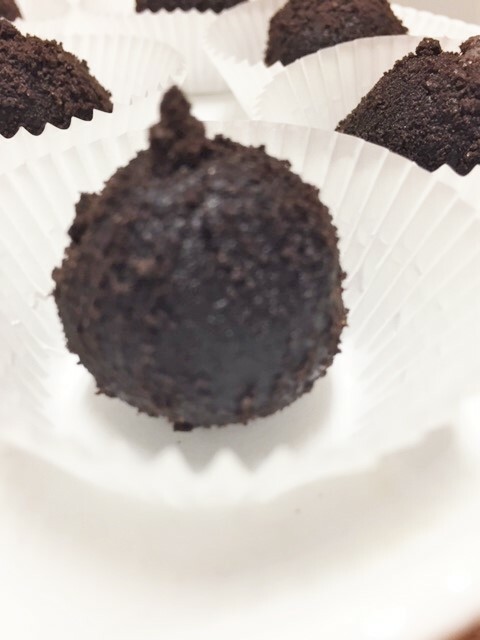 I also made some chocolate red wine truffles that are DELICIOUS. I will be posting those later in the week. Optional flavoring: 1 tsp coffee liquor, Chambord, rum, bourbon, etc. Remove all of the white filling from the cookies of one of the packages. If you want the truffles sweeter, leave the filling in 3 or 4 cookies. 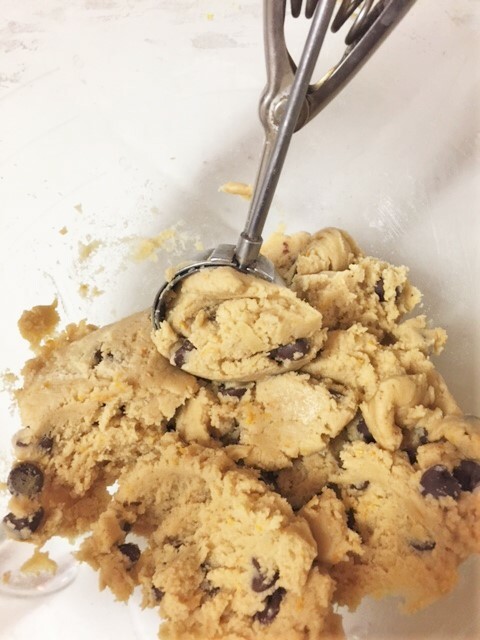 Place the cookies in the food processor and blitz, blitz, crush, crush to a fine crumb. Add the cream cheese and flavoring. Blitz again until you have a smooth mixtures that all comes together. 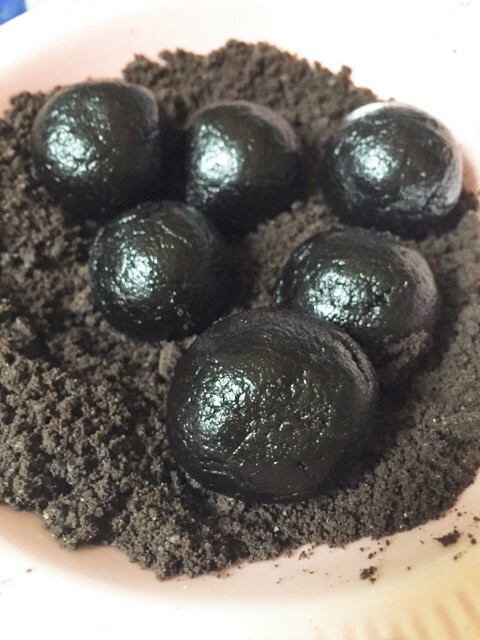 Form the mixture into 1″ balls. NO FOOD PROCESSOR? Put the cookies into a large zip lock bag and crush them to smithereens with a rolling pin or something heavy. 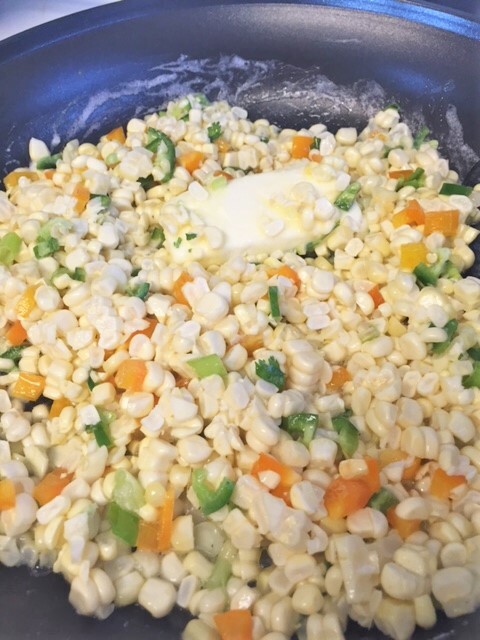 Dump the crumbs into a bowl and add the cream cheese and mix it all together with your hands. Form into 1″ balls. Take half the cookies from the other package and remove the filling. Crush the cookies into crumbs. Roll your balls into the crumb mixture, gently pressing the balls into the crumbs. Place into little paper candy cups. Store in refrigerator. These are good served chilled or at room temp. 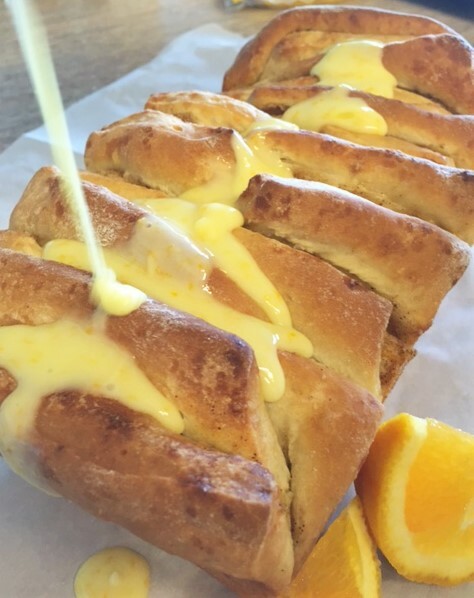 Oozy, goozy, sticky sweetness. That’s what this treat is. 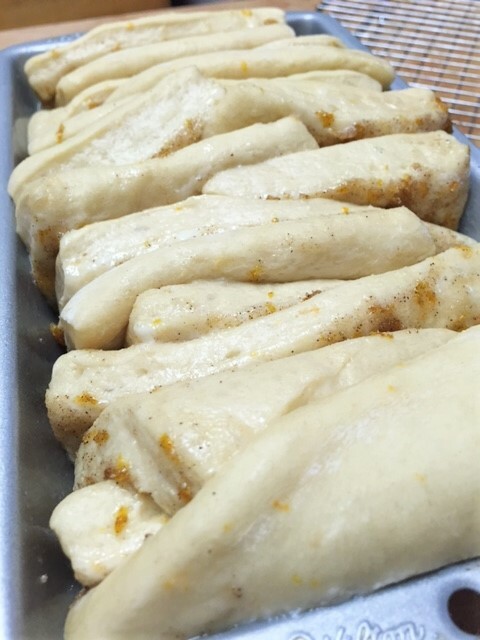 Tender folds of orange doughy goodness, with a hint of cinnamon and vanilla. OHMERGAWWWD. Besides the fact that this is absolutely delicious, it’s fun to eat too. You pull apart the layers one by one, pop them into your mouth….ya say mm-m-m-mmmm and go for the next layer. Seriously this is good stuff. 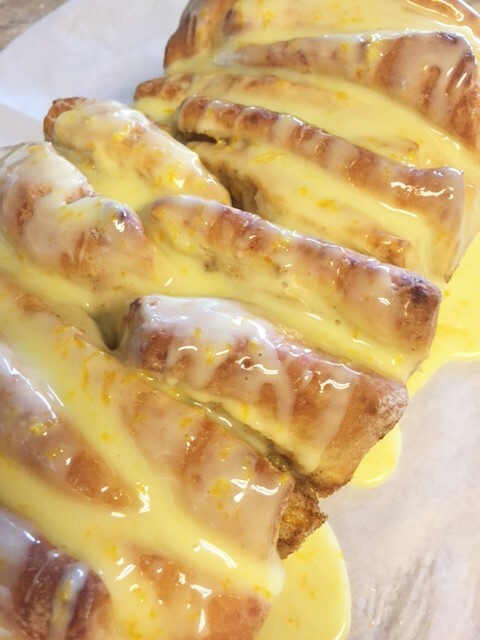 I’ve made this with lemon, orange, cinnamon-butter. All are good. But this orange is my favorite. It’s been awhile since I made this. I can’t believe I haven’t posted it until now. I used my basic cinnamon roll dough. You can use the frozen Bridgeford bread dough, if you are not into making doughs. It works fine, but of course homemade dough is best. Use your favorite cinnamon roll dough recipe, or use mine. You can even make this in muffin tins. That’s fun too. Remove dough from bowl and place it on a floured surface. Roll out to about 12″ x 16″. Mix together the ingredients for the filling. 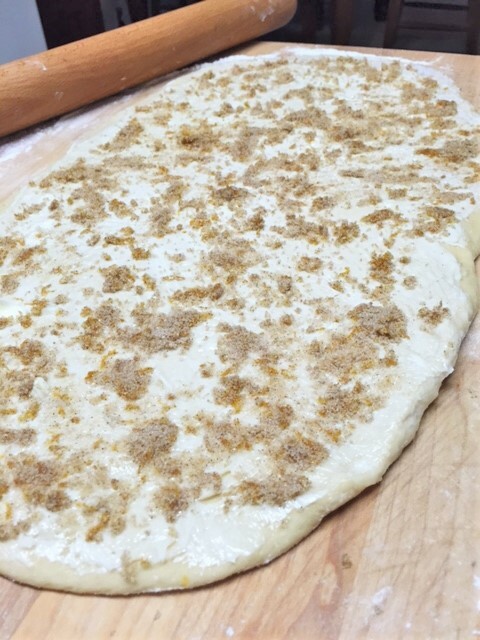 Gently spread it all over your dough. 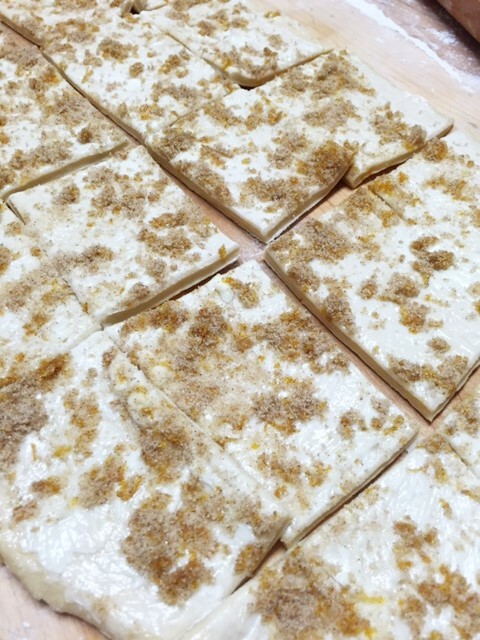 Cut 4″ squares of dough. Lightly grease a loaf pan. If you don’t have a loaf pan, use a cake pan. If you use a cake pan, cut your dough squares 3″ x 3″. Place your squares of dough into the loaf pan, placing some with the corners up. (makes it prettier) Don’t press them tightly together. Cover with a loose towel and let it set for about 30 minutes. Preheat oven to 350 and bake loaf for about 25 minutes. I tend to under bake these since I like a bit of doughy-ness.